Now in its second model year, Land Rover’s Discovery Sport still looks fresh and new, but that hasn’t stopped the British SUV brand from making some important changes to this 2017 model. New this year, Land Rover’s InControl Touch Pro touchscreen infotainment system is now available. Its larger 10.2-inch display is a welcome upgrade from the already sizeable 8.0-inch base system, while its quicker processing speed and larger 60-gig solid-state hard drive means that available features such as navigation and the integrated 3G Wi-Fi hotspot work faster. The upgrade also includes an 825-watt, 17-speaker Meridian sound system, which is over the top even for the luxury sector. Additionally, the Discovery Sport is now the first Land Rover to sync with Tile, a location resource that uses Bluetooth to monitor personal items such as keys, phones, wallets, or bags. The rest of the 2017 Discovery Sport’s improvements include a $3,800 Dynamic Styling pack reserved for top-tier HSE Luxury trim, boasting unique exterior details plus red piping and stitching inside, and four new premium colours, including Carpathian Grey, Farallon Black, Silicon Silver, and Aruba. One of many brand traits I appreciate about Land Rover is its nod to personalization. No matter whether you’re buying a base $42,790 SE or fully loaded HSE Luxury, a full spectrum of colours is available, some quite radical. Then comes the ability to change body-colour mirror caps, A-pillars and the entire rooftop to grey or black, to swap the HSE’s silver grille, undertrays, side vents and wheels for yet more glossy black, the latter in multiple styles and sizes, while the list of customizable options goes on and on. My HSE tester was actually fairly stock this time around, keeping its upgraded aluminum-look exterior detailing in place, which I think works very well when wearing dark body panels. As part of its HSE upgrade it also included signature LEDs for the HID headlights as well as fog lamps, while the panoramic sunroof would be more noticeable in a lighter colour. Standard HSE features that are a little more difficult to initially notice include headlamp washers, front and rear parking sensors, a rearview camera with active guidelines, memory for the driver’s seat and side mirrors, and front seat heaters to keep the upgraded grained leather upholstery warm in winter. I should mention the HSE includes much of what comes standard in the base SE, such as 18-inch alloys, rain-sensing wipers, an electromechanical parking brake, pushbutton ignition, dual-zone auto climate control, eight-way powered front seats, partial leather upholstery, a 5.0-inch colour TFT multi-information display, 8.0-inch InControl Touch infotainment, great sounding 190-watt 10-speaker audio, trailer stability assist, all the expected active and passive safety features, and much more. Additionally, my tester increased its already improved HSE trim to include a Convenience pack with proximity keyless access, a powered gesture liftgate, a garage door opener, and an auto-dimming rearview mirror. What’s more, a 5+2 Seating pack added a segment-exclusive third row that fit my five-foot-eight medium-build body well, plus third-row climate control venting in the ceiling, and an extra USB port back there too; a Driver Tech pack added autonomous emergency braking, blindspot monitoring with reverse traffic detection, new for 2017 lane departure warning, and traffic sign recognition with a new Intelligent Speed Limiter; while standalone options included ventilated front seats and heatable rear seats, navigation, a black headliner, and more for an as-tested asking price of just $55,225. The Discovery Sport HSE starts at $46,990, incidentally, which represents good value in the compact luxury SUV segment. More importantly than a summary of its features and options are takeaways from time spent with multiple versions of the relatively new SUV. First off, like its exterior styling the SUV’s interior is intelligently laid out in what is becoming a trademark Land Rover cabin design. I call it premium industrial, in that everything is ruggedly built with oversized dials, door pulls and centre stack buttresses, but it’s all finished to a very high level. The features just mentioned and more are trimmed in satin aluminum, most surrounding surfaces are either soft synthetic or stitched leather, and switchgear quality and damping is very good. I especially like those dials just mentioned, three of which come filled with digitized centres for controlling the HVAC system, while the final fourth is the rotating gear selector that powers up out of the lower console upon startup. 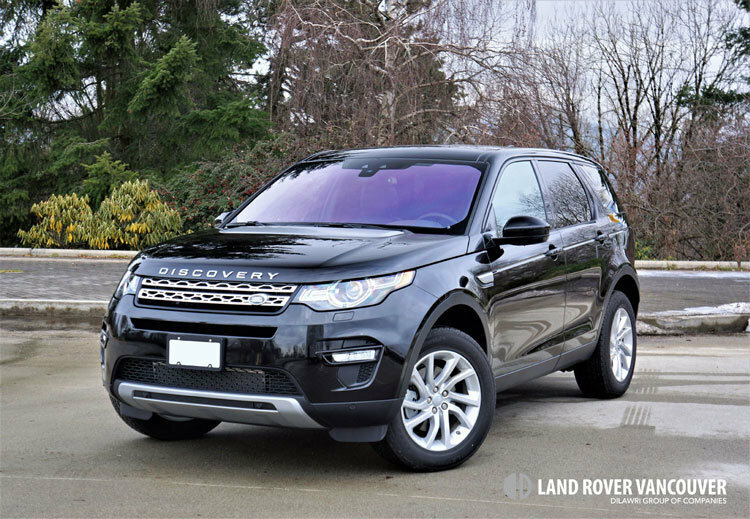 All Discovery Sports use a button for the latter process, which fires up the same direct injected and turbocharged 2.0-litre four-cylinder engine no matter the trim, tuned to provide an impressive 240 horsepower and 250 lb-ft of torque. It comes attached to a class-leading nine-speed automatic transmission with standard steering wheel paddle shifters, which send the engine’s thrust and twist to a sophisticated four-wheel drive system featuring Land Rover’s very competent Terrain Response off-road system. To be clear, the Discovery Sport doesn’t include the usual Land Rover transfer case or locking differentials, but it smartly offers a bull-low capable first gear system that’s designed to limit launch speed so as to slowly crawl out of slippery situations or over obstacles, and even sports an available low-speed off-road cruise control system dubbed All Terrain Progress Control. The SUV’s relatively lofty 211 mm of ground clearance joins standard Terrain Response just mentioned, which modulates the engine, transmission, differentials, and chassis systems after selecting General Driving, Grass/Gravel/Snow, Mud/Ruts and Sand modes to overcome just about any challenge. Drivetrain is also a miser on fuel with a claimed rating of just 11.9 L/100km city, 9.0 highway and 10.7 combined, but most premium buyers will probably appreciate its on-road performance more. The Discovery Sport gets up to speed quickly and feels very controlled on the highway, while its ride is wonderfully smooth over rough patches of pavement. You sit higher than some rivals and therefore enjoy better visibility all-round, yet it’s still very capable through the corners when pushed hard. If you want even more canyon carving capability, Land Rover will include an Adaptive Dynamics suspension and an Active Driveline when opting for the Intelligent Dynamics package, which is essentially torque-vectoring all-wheel drive with magnetic damping, and/or you can opt for the 19- and 20-inch wheel and tires packages on offer. Options in mind, I’ve only touched on all that’s available with the HSE, the Vision Assist pack that adds adaptive cornering headlamps with auto high beams and a 360-degree surround camera also available; as is the TouchPro pack that adds the aforementioned larger infotainment interface with enhanced navigation, top-line Meridian Digital Surround audio, and emergency telematics bundle. Additionally you can get lane keep assist and a driver condition monitor that will wake you via visual and audible alerts if you’re falling asleep, a heatable windshield, self parking, a head-up display, Wi-Fi, InControl Apps, satellite radio, configurable mood lighting, a perimetric and volumetric alarm, a cargo cover, cargo area stowage rails, and more. On the subject of storage, few compact SUVs offer more. Laying the third row flat requires a quick tug on each seat’s pull tab to automatically drop the headrests before pushing them forward, which opens up 926 litres of available space. The second row is even more conveniently split into the optimal 40/20/40 configuration, which lets you stow long cargo like skis down the middle while rear passengers enjoy the more accommodating window seats along with those aforementioned heaters if upgraded, plus when all seatbacks are completely laid to rest the Discovery Sport can manage up to 1,894 litres of lifestyle gear. There’s much to like about the Discovery Sport, which is why it’s high on my list of compact luxury class favourites. I like the way it drives, how it looks, its standard feature set, and the ability to option it out the way I’d want. As long as it keeps building SUVs like this, Land Rover’s future looks very bright.